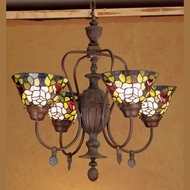 Cheap Tiffany Lamps - Floor, Wall, Ceiling, Table ~ DISCOUNTS! 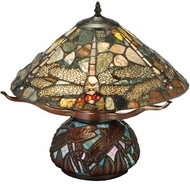 Do you own a real, antique Tiffany lamp? If you do, I might be tempted to quote Indiana Jones and say, “it belongs in a museum.” What you own is likely to be a lovely, lead-free reproduction. In other words, a Tiffany-style lamp. The only authentic Tiffany lamps were made by Louis comfort Tiffany before his death in 1933; but don’t be glum, you may have a reproduction plaque or certificated imitation Tiffany light. This is no shameful thing! Original Tiffany lamps, though beautiful, are usually found in private collections or museums because they are worth hundreds of thousands of dollars. Unfortunately, those lights are likely to contain lead. So breathe easier! You will not be condemned for wanting a Tiffany-style lamp! 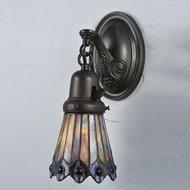 We sell the bronze base, leaded glass-look lights at affordable prices. 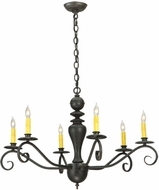 Yes, you can find affordable Tiffany-style lighting through us. 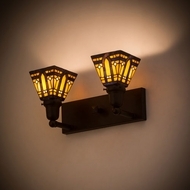 In addition, the best Tiffany lighting manufacturers such as Meyda Tiffany, Dale Lighting and Quoizel Lighting specialize in the reproduction of affordable Tiffany light fixtures. Louis Comfort Tiffany worked with Thomas Edison in 1885 to decorate the first stage in New York City lighted by electricity! Can you blame these three brands for reproduction of discount Tiffany chandeliers as a way to carry on Louis Comfort Tiffany’s legacy? 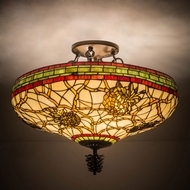 Buy the best reproduction of original Tiffany lamps you’ve been pining for! Sit back and enjoy this ride of a guide! 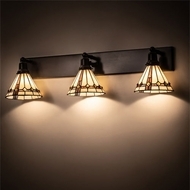 What is the difference between these three manufactures of inexpensive Tiffany style lighting? 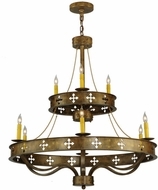 Quoizel Lighting has been called an undisputed leader in the reproduction of Tiffany light fixtures for sale. 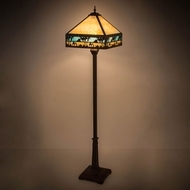 Quoizel imitates Louis Comfort Tiffany so well that this discount Tiffany style lamp manufacturer uses eclectic colors and designs that look like one-of-a-kind masterpieces. 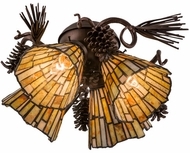 Meyda Tiffany Lighting excels in organic shapes and nature motifs such as lily pads and dragonflies with their reproduction of inexpensive Tiffany light fixtures. Designer Clara Driscoll, friend of Louis Comfort Tiffany, is credited with promoting the sale of the Tiffany Lily pad light. The motifs and magnolias used in the affordable Tiffany style lamps were the favorites of the original Tiffany Studios. 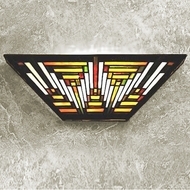 Dale Lighting is praised for stunning, stylish, somewhat masculine design of geometric discount Tiffany lighting. 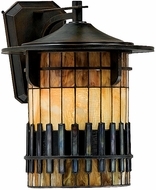 Dale Lighting’s Noir 1 reproduction of a Tiffany light embodies this attractiveness in a mica bronze finish. 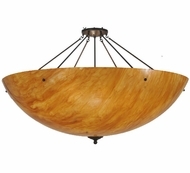 Come for Dale Tiffany Tiffany style lamps for sale and leave with a Dale Mission 1 lamp you like even better. 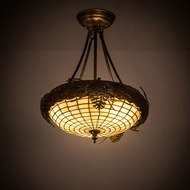 What type of interior design goes well with the best Tiffany style lighting? 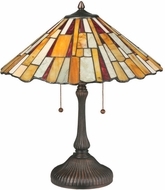 An inexpensive Tiffany style lamp works well with upholstered furniture with exotic embroidered silk fabrics. Another option for interior design that would work well with Tiffany lighting is stenciled wall paper with seed heads and Japanese-inspired flower patterns in fabric. Louis Comfort Tiffany’s lifetime, the West was fascinated with art from the Near East and Asia. 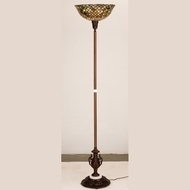 Buy Tiffany style lamps if you would enjoy decorating with smooth wood or ceramic sculptures of mythological creatures such as dancing nymphs from Ancient Greece and Rome. When you buy Tiffany chandeliers you should think Art Nouveau as opposed to Art Deco in America. 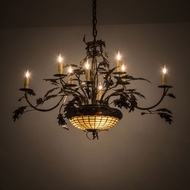 This means use organic shapes such as furnishings that mimic asymmetrical branches and blossoming brambles when using reproductions of the best original Tiffany lamps. What home decor accents complement geometric Tiffany desk lamps? The best Tiffany desk lamps are well suited to Art Deco home decor. 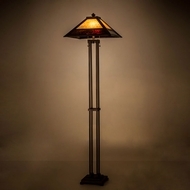 Inexpensive Tiffany desk lamps work well with accents such as chrome, pictures of railway stations, and restored radios from the 1940s. Affordable Tiffany desk lamps work well with other Art Deco accessories such as sculptures of a sensuous-posed female dancers or graceful running cheetahs fit for the time period. When you buy a Tiffany style lamp, choose silver satin for fabrics for your upholstery and black and white framed photos of modern architecture for your minimalistic walls. 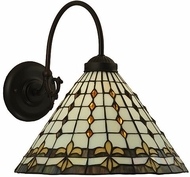 What colors and shapes are available in reproductions of the best original Tiffany lamps? 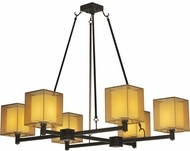 Unlike cheap Tiffany chandeliers from home improvement stores, the Tiffany light sold here are the highest in quality. 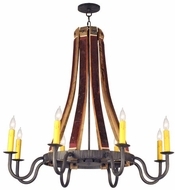 The best Tiffany light has fixtures with a handful of rich, vibrant hues. 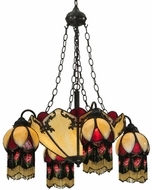 Tiffany lamps, that fit this category, can be explored in the Meyda or Quoizel collections. 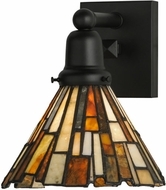 If you are hunting for more geometric, Jazz Aged Tiffany lamps, then you may want to pursue the earth toned, sleek line lights through Dale. Noir 1 by Dale is especially smoky, sleek-lined and handsome. Louis Comfort Tiffany was fond of the shape of the nautilus shell. His friend, designer Emarael Freshel, crafted the famous Tiffany wisteria flowering tree lamps. Meya reproduces Tiffany peacock shade lamps. 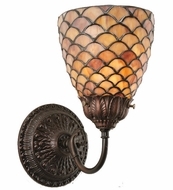 Grab these imitation torchiere lamps with Tiffany shades of flared, undulating teal feathers. 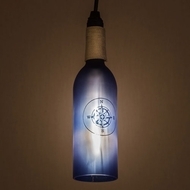 Dedicated to one main color, blue, but flexible about the shape of Tiffany-style table lamps? We have your answer. 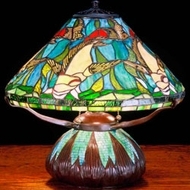 You can browse Dale’s affordable Tiffany lamps for geometric pyramid shape Arts and Crafts era lamps. You can also find that same vibrant blue hue in the floral and organic shaped lighting of Meyda Tiffany and Quoizel Lighting.